Ward Aerials are experts at installing Sky and other satellite systems in North London, London and the South East of England. 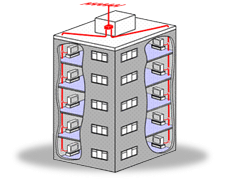 In addition, we repair and maintain aerial systems ranging in size from single dwelling to large estates and hotels. Need an additional socket in the kitchen or bedrooms - give us a call. FREESAT Enjoy 150 TV channels and more FREE via your SATELLITE. Our multiroom installations allow you to watch whatever you want wherever you want and can be customised to your exact needs. They can incorporate multiple devices such as satellite receivers (for Sky, Hotbird, Freesat, etc) DVD and Blueray players as well as terrestrial TV and radio. Tell us what you'd like and we'll design your system for you. 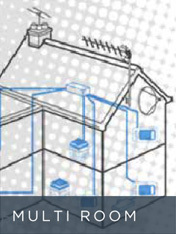 Ward Aerials have been installing maintaining, communal TV systems for over 40 years. 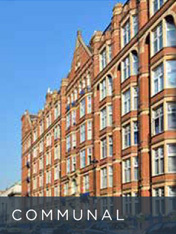 Our clients include Managing Agents, Local authorities, Housing Associations and Private Landlords. 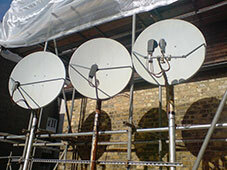 Need to relocate dishes (and or aerials) during building work? We can move them on to the scaffold, or elsewhere, extend the cabling and then refit them to your property once your work is complete. 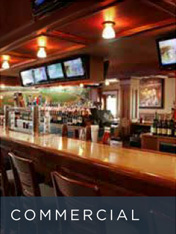 In addition to "residential" installations, we also work for many types of commercial client. These range from hotels, restaurants, pubs and bars, to embassies, offices, schools, hospitals and care homes.